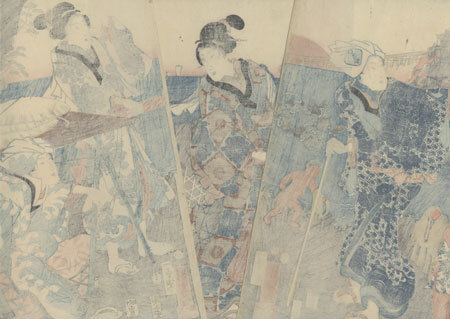 Comments - Beautiful triptych of women and young children enjoying an outing to Futami-ga-ura to view the famous Wedded Rocks. At left, a beauty climbs out of a palanquin, sliding one foot into a waiting sandal. In the center, a woman bending over seems to be emptying her pipe, a small coal on the ground sending up a wisp of smoke. 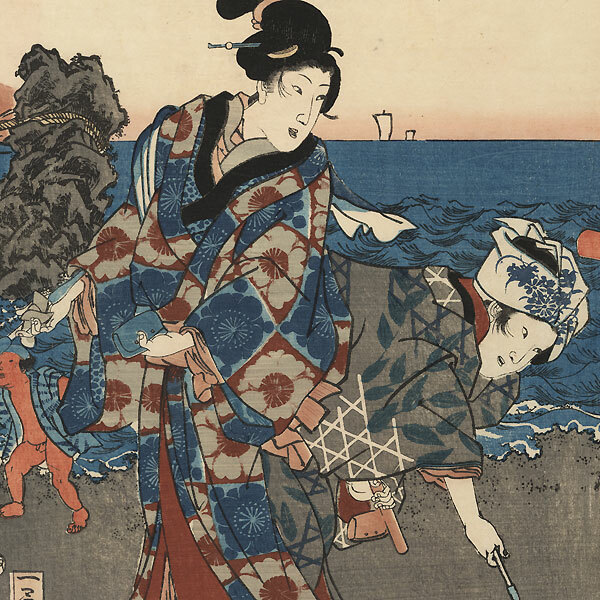 At left, a young boy holding a sacred shimenawa rope asks where to put it, and the beauty gestures her reply. Two other little boys run along the beach as waves lap at the shore. The Wedded Rocks rise out of the splashing water at left, joined with a sacred rope, a red sun visible along the horizon. An attractive image with nice large figures and a handsome natural setting. Condition - This print with excellent detail as shown. Three separate panels. Slight toning and soiling. Please see photos for details. Good overall.